A journey taken by director Jed Schlegelmilch to better understand and gain more closure about his brother John's suicide, 17 years after it happened. 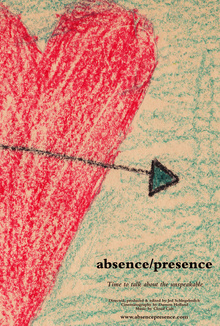 Absence/Presence is a story about love, loss and acceptance as Jed, along with his family and friends, deal head-on with trying to overcome the devastating effects of suicide and learn more about who John was. You get Absence/Presence plus an additional version with director commentary track by Jed Schlegelmilch.